Bañares A., Blanca G., Güemes J., Moreno J.C., Ortiz S. (eds. ), 2004. Atlas y Libro Rojo de la flora vascular amenazada de España. Dirección General de Conservación de la Naturaleza. Madrid. 1069 pp. 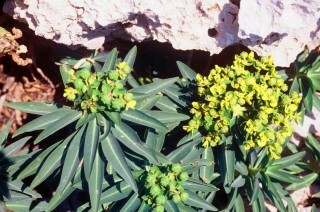 Euphorbia margalidiana is endemic to the largest of Ses Margalides, a group of islets close (430 m) to the north-western coast of Ibiza in the Balearic Islands. In 2005 it was also introduced on the islet of Illa Murada, 190 m away from the north-western coast of Ibiza. 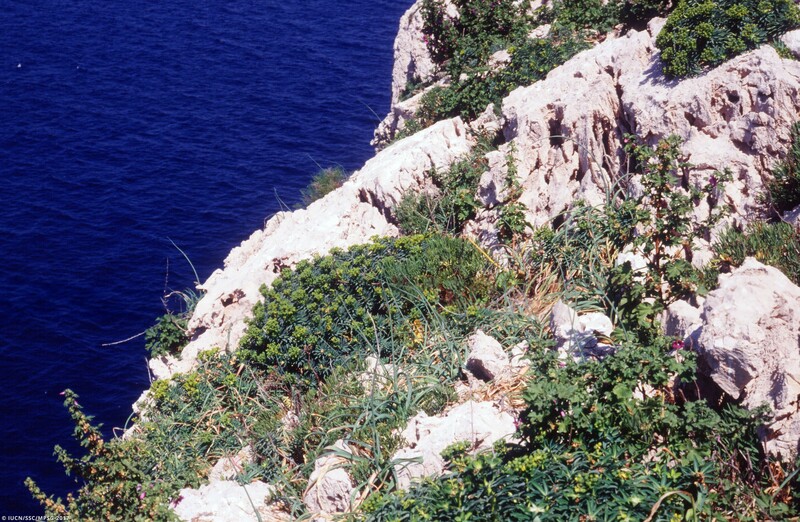 The species grows on rocky shores colonizing the cracks of friable limestone cliffs and boulders, just above the area under salt-spray influence, between 5 and 10 m a.s.l. 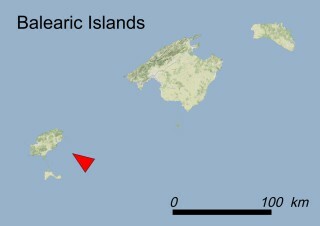 (habitat 13.1: Sea cliffs and rocky offshore islands). It is a shrub growing up to 100 cm in height. 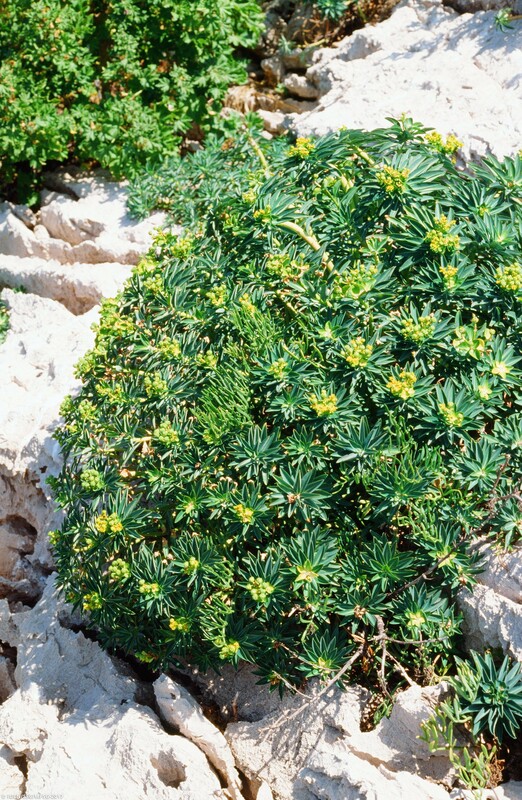 Stems are erect to procumbent with a woody base and are somewhat succulent at the top, allowing the plant to tolerate long-lasting drought periods. 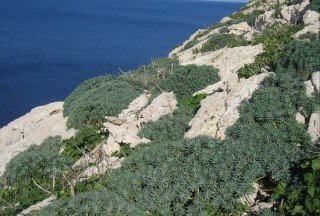 The leaves are lanceolate, entire and glaucous (light bluish-green). The plant blooms between March and April and the flowers, called cyathia, are arranged in umbrella-like inflorescences called pleiochasium. The fruit is a cylindrical capsule with spheroidal dorsal warts. The seeds are ellipsoidal, smooth, dark grey or black. E. margalidiana is a perennial plant that requires full light and high temperatures. Like other spurges adapted to summer drought, its leaves drop off at the end of the spring and grow back again in autumn, so that during summer photosynthesis is performed by the tips of the branches. The dry fruits open though a sort of ‘explosion’ mechanism, projecting the tiny seeds far away from the parent plant from June to July. This species is closely related to Euphorbia squamigera found in eastern Spain, southern France and Majorca. 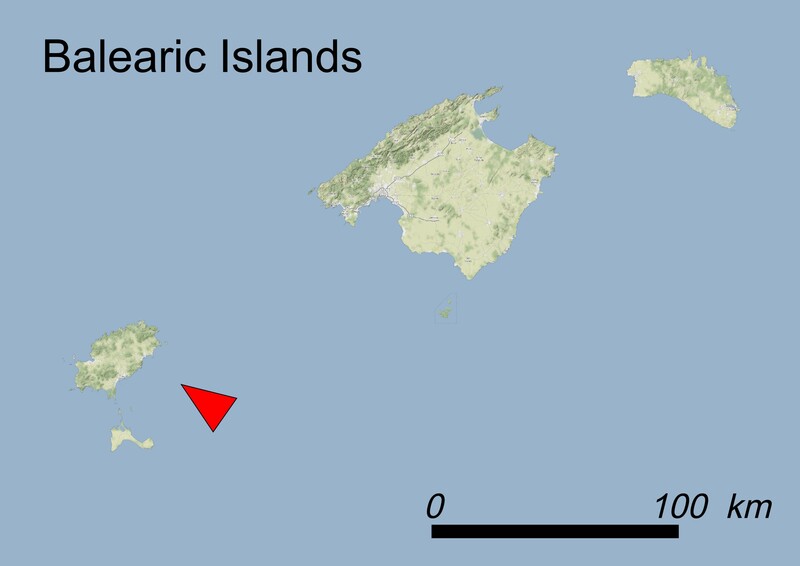 Despite being only known from one small natural location, no human activities severely affect the local population given the isolated location and the difficult access to Ses Margalides. Only the occasional presence of fishermen (threat 6.1: Recreational activities) or scientists collecting specimens for studies (threat 5.2.1: Gathering terrestrial plants - Intentional use) may represent a threat for the species. 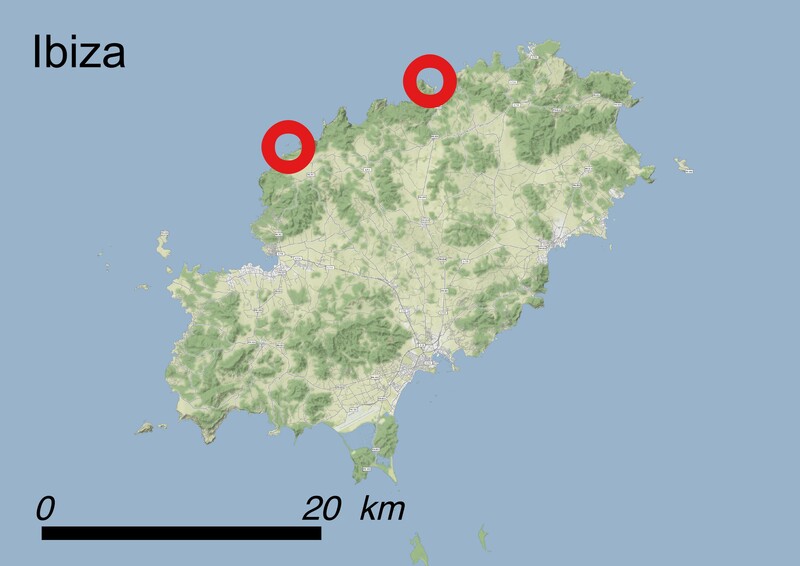 As concerns natural threats, the increasing size of yellow foot-legged seagull colonies may affect the plants due to excessive nitrification and to direct damages during nest building (threats 8.2.2: Problematic native species/diseases - Named species, and 11.1: Habitat shifting & alteration), while no knowledge on potential competition due to co-occurring native species is yet available. Moreover, the increasingly dry conditions (threat 11.2: Droughts) and the collapse of the cliffs (threat 10.3: Avalanches/landslides) due to sea erosion may represent threats in a long-term perspective. 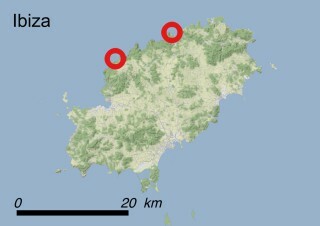 On the other hand, no achieved proofs or evidences of heavy impacts have been recorded during recent monitoring activities, so that E. margalidiana is mostly threatened with the risk of genetic drift (threat 10.1: other threats) due to the small size of its population and its tiny area of occupancy. As a matter of fact, the natural population covers an area of less than 8 ha (<0.08 km2), whilst recent field surveys allowed to count between 700 and 900 individuals. 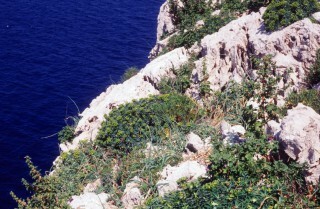 Monitoring activities are difficult because the cliffs are unstable and dangerous and climbing techniques may cause damage to its habitat. 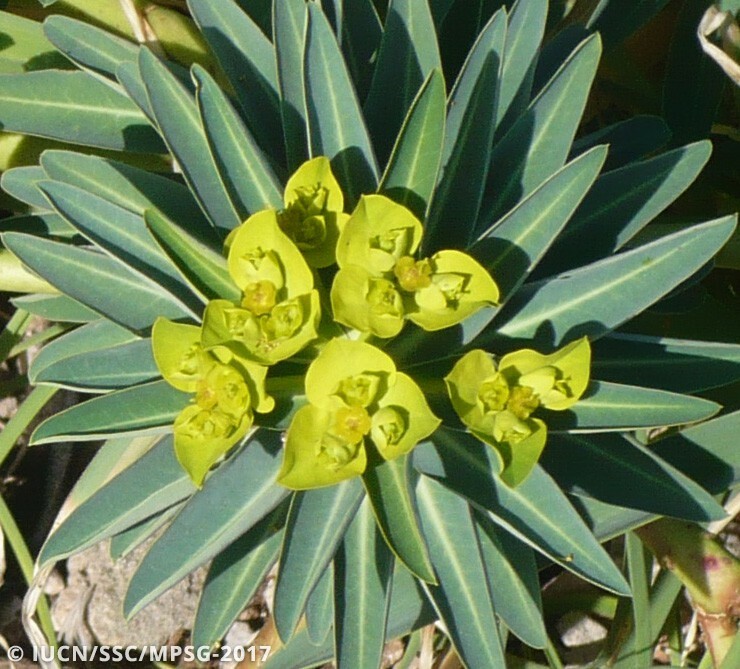 Monitoring activities also allowed to ascertain that the new population created in Illa Murada is well established and plant numbers naturally increasing. As there has not been any significant reduction nor fluctuation in numbers in the original population, a strict application of the IUCN criteria suggests to underscore the risk level of the species from which should now be considered as VU (Vulnerable) according to the to IUCN Red List criterion D1+2. Legally: This species is listed in Annex II of the Spanish Ministerial Order 22112 (1984) as a species of special national interest to be protected in the Balearic Islands. 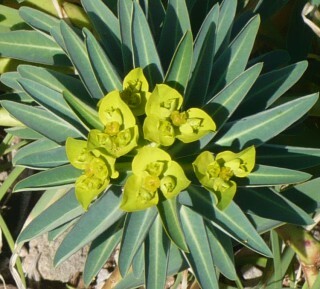 It is illegal to undertake any activity that could damage this plant. E. margalidiana is listed in Annex I (in danger of extinction) of Decree 439/90, which guarantees its protection in its native habitat. It is also listed in the Spanish Red Book. Internationally, it is included in Appendix I of the Bern Convention and as a priority species in Annexes II and IV of the 92/43 EC Habitat Directive. Since 2009 an ad hoc recovery plan (Resolution 14 july of the Government of the Balearic Islands) has been carried out. Murada islet is within a Natura 2000 site ES0000241 ‘Costa dels amunts’. In situ: Between 2005 and 2007, respectively 150 plants and 325 seeds of E. margalidiana were implanted on the Murada Islet, which presents similar environmental conditions than Ses Margalides and is located in the same area. Monitoring activities on the survival and recruitment rate of seedlings provided encouraging results. For this reason, from 2010 onwards, periodically, more propagation units (220 new plants) have been introduced in order to achieve a viable population. A similar action carried out on the cliffs of the north-eastern coast of Murada was totally unsuccessful. 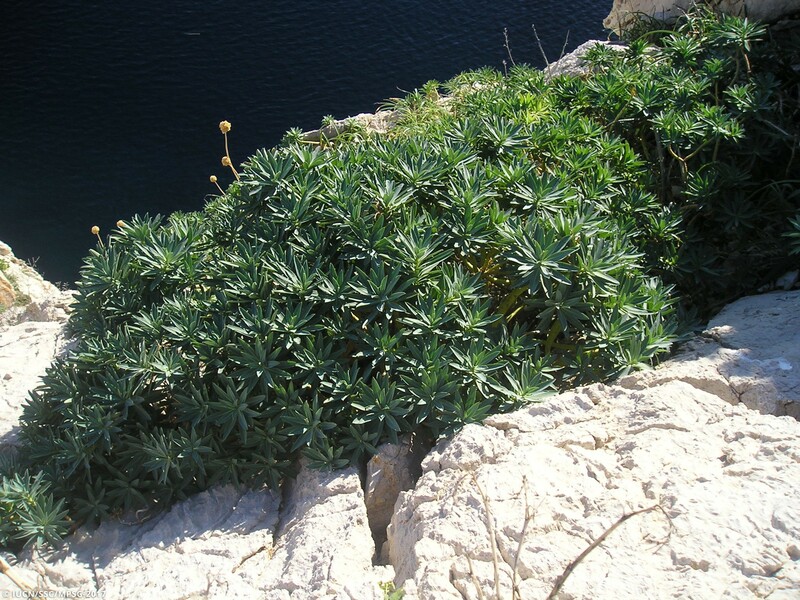 Ex situ: This species is under cultivation in several places including the botanical gardens of Sóller (Majorca) and Marimurtra (Barcelona) in Spain. Seeds are also being conserved in several seed banks. Studies on the genetic variability of ex situ material are being undertaken. The follow-up of the introduction performed in Murada islet is strongly recommended in order to check for its long term success. Moreover, it is important to assess whether the observed seedling recruitment is maintained over time. Vicens Forteza, Director Parc Natural de ses Salines d'Eivissa i Formentera, Govern Balear.